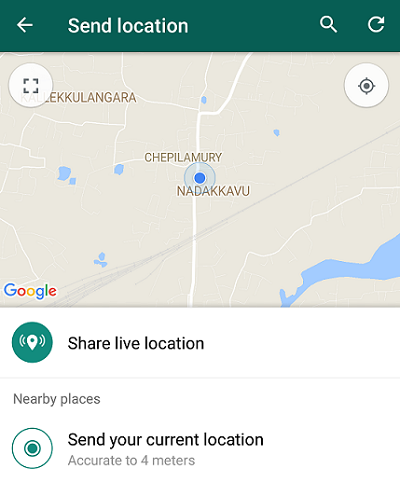 WhatsApp has recently introduced live location feature to share your current location with other people on the chat app. It is a great option especially if you are in a strange place & not familiar with the landmarks and the destination to where you are supposed to reach. The other party can easily track your location, pick up or direct you on how to reach the destination. To share your location, open WhatsApp first. Tap New Message icon from the bottom > Choose a particular person or group. If you want to share the information through an existing thread, open it. Click paper clip icon on the message box. It will show you various options including Document, Camera, Gallery, Audio, Location, and Contact. Select Location from them. Grand necessary permissions to WhatsApp to access your location data. After fetching your information, it will show your current location on the Google Maps. 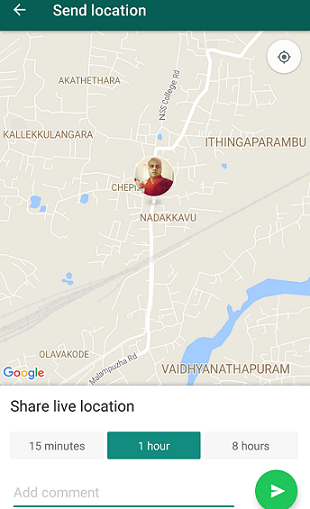 Choose Share live location. A box will open with the message ‘Participants in this chat will see your location in real time. This feature shares your location for the duration you choose even if you’re not using the app. You can stop sharing at any time’. Click Continue. Now WhatsApp allows you to set a time period for which you want to share the location- 15 minutes, 1 hour and 8 hours. Enter comments if any in the chat box and hit the Send button. The recipient will receive a message along with your live map location which will be continuously updated for the period you specified. You can open the map and click on stop sharing to stop sharing the location anytime.